If I never sleep, does it ever have to end? Let's see if Apple can redeem themselves. Yesterday's situation was a major fail. Today, right when I woke up, I called Apple. They issued a return and I sent back my iPhone. I had a couple options for ordering my replacement. I could either order over the phone, order online again, or reserve one at a store. I didn't want to do either of the first two options because how would I be able to guarantee that the phone was actually unlocked? I wouldn't put it past Apple to make the same mistake again. And I just didn't wanna wait that long—it takes forever for a phone to get to America from China. The customer service guy told me that the unlocked iPhones weren't releasing in stores til tomorrow and even then, it wasn't guaranteed that they would be there. I would have to check back at 9 pm because that is when the store reservations begin. No joke, I checked at 8:59 and it showed that it was at the Apple Store I wanted to go to, but it wouldn't let me click "select" cuz it wasn't 9:00 yet. THAT'S how precise they are. At 9:02, it worked. It WORKED. I reserved my black 16gb iPhone 4S. I hope I get to take it home with me tomorrow with NO problems. Fingers crossed! Sometimes in life, you can't help but be a little jealous. Usually at work, I take care of the time cards for us hourly "employees." Today, when I was asking everyone for their time cards, one of the girls sent me an instant message and told me that she doesn't need them anymore. Not gonna lie, there was definitely that hint of jealousy. Or maybe it was more than a hint. I've been at this job for almost 8 months and I'm still a temp. I LOVE my job, but I can't be a temp forever. Today is my parents' 31st anniversary. And can I just say, I am SO thankful to have parents that love each other and love me and love the Lord above all. Christian parents are so awesome and I am definitely blessed with 2 of the best! I've been in a bubble my whole life. It's one of those things that hit me like a train when I got a "real job." I mean, I knew that I had been in a bubble to some extent. I went to private schools from pre-school all the way through college. But I didn't realize how I had enclosed myself in this Christian sphere. I'm not saying having Christian friends is bad, but I had virtually no experience when it came to having non-Christian friends. I had very few opportunities to share my faith with others because everyone I hung out with me already shared my faith! It's so strange meeting all kinds of different people now. The world's opinions on just the normal situations of life are SO different than the opinions of my brothers and sisters in Christ. But being around all these different types of people only makes me more appreciative and thankful of the Christian friends I have. God has been so good and has blessed me with many godly people in my life that have been there for me through thick and thin. In light of Thanksgiving coming up in a few days, I felt the need to express my thanks to all my friends who have been there for me in all my different circumstances, encouraging me constantly in my walk with the Lord, and encouraging me to stay on the path that Christ has paved. I just got home from an amaaaazing concert. The Civil Wars were awesome as always. And Milo Greene were awesome as well! I love The Wiltern! Such an awesome venue. It was pretty funny how many Calvary people we kept meeting and running into. It's a small, small world. That whole 6 degrees of separation thing, I definitely believe it! Scatterbrain blog post! Sorry! Ha! P.S. They sang Billie Jean! Listen! I'm cheating a little. I'm changing the time of this post so it shows that it's posted on the right day. I mean, technically, that's not even cheating because I just got home. So even though it's after midnight, it's still my Thursday. Aaaand, I just wrote a paragraph and deleted it. I'm getting better with this whole prudence thing. God's teaching me a lot about prayer and about trust these days. I'm learning that a big part of prayer is just sitting there in silence and listening to God speak. I talk too much, and often I think I am a hindrance in my own life, because even when I pray about something, I focus too much on what I am telling God rather than what He is telling me. Just a little something. Don't mind my overuse of commas in this post. It is almost 1 a.m. This may be cheating, but I don't care. This song is so powerful! Read the lyrics and then listen to it. Ok, I'm drawing a blank. If you would have asked me when I was still in the process of deciding if I was going to spend a nice chunk of money to buy and iphone, I would have been able to come up with a much better list. But this list is sufficient for my purposes, I guess. Here you have it folks: Blackberry vs. iPhone. Feel free to harp in! hipstermermaid is my FAVORITE account on twitter. I nearly pee my pants from laughter every time I read any of his tweets. Today, he made a blog. SOOO exciting. I decided to share my excitement with my friend Josh (who actually knows him). 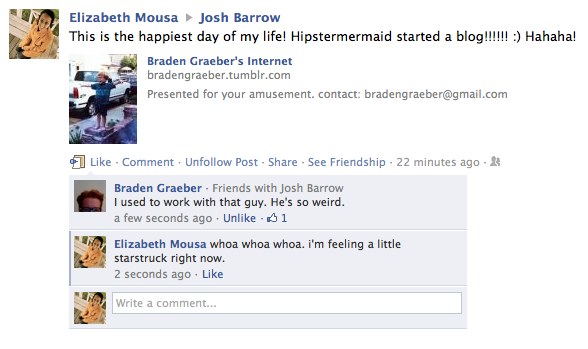 And the mastermind behind hipstermermaid himself commented on my wall post. STARSTRUCK, I tell you. Last night, I went to an INCREDIBLE Gungor concert. They are truly a group of talented musicians. Their set list was arranged differently than they typically would do it. They went along with the flow of their new album, keeping it as a narrative. When they got to their song "Ezekiel," I noticed something strange. Now, if you're familiar with their new album and particularly this song, you will understand exactly what I am talking about. There were many many hands raised. Why?! I thought to myself. This isn't a worship song. I kept looking around the auditorium. Hundreds of people had their hands raised. I was completely confused. During a song like this, hands being raised couldn't possibly mean praise and they couldn't really mean surrender either. This song was written based on an extremely graphic chapter of the Bible (Ezekiel 16). In this chapter, the prophet Ezekiel went on rant because God's people were whoring themselves to the world. The song actually tones down the intensity of the chapter a bit. This is not a song where you would typically lift your hands. I feel like people often fall in the slum of Christian cliché. It's what you do. You're at church and music is playing so you habitually lift up your hands. You don't even realize what words are being sung. In fact, your mind isn't even there. You're thinking about dinner later that night or what you're doing the next day. Have you ever found yourself in the slum of Christian cliché? I wrote three blog drafts late last night and realized today that I shouldn't post any of them. 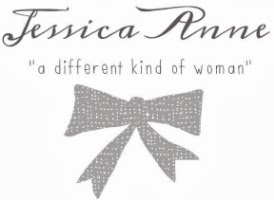 Note to self: your blog is not your journal. There's a lot going on in my life these days, a lot that's keeping my brain and heart occupied. I have been praying a lot about prudence, something I don't have that I wish I did. It's often hard for me to know when to keep my mouth shut. I open up so quickly. I tell everyone everything and almost always regret it. It seems like this is the lesson I have been learning lately. It's almost as if God is allowing the drama in my life in order for me to learn when to be prudent and when to share it with others. One of my friends said it well: "Life is like a box of chocolates, don't let everyone have a piece of it." SO true. It's hard to get things back once you've given them away. Especially emotions. I'm working on it. God is teaching me. "I, wisdom, dwell with prudence, and I find knowledge and discretion." Life has gotten extremely busy. I am tired of being an adult, but there is no turning back. Working full-time has gotten the best of me. I am trying to maintain my social life, but that requires a sacrifice of sleep. This probably is detrimental to my health. But I deserve to have friend time, right? Even in the midst of my busyness, I am taking on the challenge of blogging every day for November Blogfest. Why, might you ask? To get back into a routine. Somehow, routine maintains responsibility and helps keeps me focused. "In the midst of stress I try to cope by shutting down parts of my life; I unplug, and drop the ball. My walk falters. My relationships become more distant as I become reclusive. My work suffers. My ministry suffers. I suffer. And yet I march proudly down this road imagining that I’m on another. Well convincing—lying to—myself and others that I am hard at work accomplishing all that God has set before me." My walk has definitely been suffering lately, as has my ministry. And here I am, taking on another task. For the next month, I am going to use my blog as a place to unwind, a place to make sense of all the things God is showing me. There will be the random post here and there (how can I do away with those? ha! ), but for the most part, I'm going to be as uncensored as I can be in a public forum. Stay tuned, folks! Hopefully you'll be able to gain some insight from what God is teaching me!